According to legend, this is from where the Lord Rama built a bridge, across the sea to Lanka, to rescue his consort Sita, from her abductor Ravana. There is a temple named “The Ramanathaswamy Temple” which is dedicated to Lord Shiva in the town which is closely associated with Lord Rama. This temple and the town are considered as a very holy pilgrimage site for both Shaivites and Vaishnavites for performing rites for ancestor’s spiritual well being. Every Brahmin, whether Shaivite or Vaishnavite, believe that it is their duty to visit, Kasi Vishwanath Temple and Rameswaram Temple, at least once in their lifetime, to give sacred oblations to their ancestors. Rameswaram is well known for its 22 ‘Theerthas’ or wells in and around the main Rameswaram temple. Rameshwaram is also spelt as Ramesvaram, Rameswaram or Ramisseram. How Do I Go to Rameshwaram Temple? 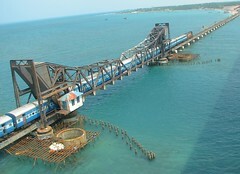 Rameswaram is well connected by train services from Tamilnadu. Nearest airport is Madurai. Rameshwaram is well connected by roads also. Rameshwaram temple is at around 572 kilometers away from Chennai, the capital city of Tamil nadu state. What are the Aquatic Related Places to Visit at Rameshwaram? Pamban island has beautiful beaches. Olaikuda Beach is famous for coral reefs and ocean reefs. Scuba diving is permitted here. Olaikuda Beach is at a distance of one kilometer from the Rameshwaram temple. Rameswaram is a fishing center with many varieties of fishes available. Dr. A.P.J. Abdul Kalam National Memorial on the island town is a newly added national monument, inaugurated on the 27th July 2017.